For many years, world record related toys, games and gifts have been produced in association with Guinness World Records. This section of our web-site will highlight some of these products, including a few early items that are now becoming increasingly collectible. 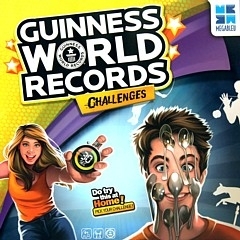 As well as being educational, many of the games encourage young people to get involved with records and record breaking; for anyone with an interest in the Guinness Record books, they are well worth a trip to the local toy shop or online auction site! A board game containing: 1 Guinness World Records game board, 150 question cards about Guinness World Records titles (600 questions), 10 orange '30 seconds' challenge cards, 10 purple 'best time' challenge cards, 1 booklet of 'Guidelines for Challenges', 1 notebook, 1 ping-pong ball, 5 counters, 1 dice. 2015: Paladone Products Ltd., UK. This set contains: 45 straws, 28 plastic connectors and full Guinness World Records instructions. This set contains: 1 plastic UFO body, 4 large rotor blades, 4 small rotor blades, 1 connector, 1 hook, 4 printed UFOs, runner bands and full Guinness World Records instructions. A series of toys and record cards given with McDonald's Happy Meals in 2014. A board game containing: 400 illustrated question cards, 6 player markers and full instructions. A card game containing: 55 question cards and instructions. 2014: Paladone Products Ltd., UK. The set contains: 16 paper planes with scored fold lines (4 high-speed flyers, 4 long-distance flyers, 4 duration flyers and 4 precision flyers) and full instructions. The set contains: 4 chassis, 4 axles, 8 wheels, washers, rubber bands and full Guinness World Records instructions. The set contains: 1 rocket launcher, 3 rockets, components to build your own rocket fins and full Guinness World Records instructions. The set contains: 5 plane bodies, 5 plane wings, 5 plane tails, 5 plastic caps of varying weights and full Guinness World Records instructions. The set contains: 2 chassis, 4 axles, 8 wheels, 2 propellers, 2 propeller props, 1 hook and full Guinness World Records instructions. 2013: Paul Lamond Games Ltd., UK. Contents: Board, 20 challenge dice, 1 special dice, 4 play pieces, 150 cards, 24 challenge cards, 16 tokens, Guinness World Records Challenge Certificate, Timer, Rules. 2012: Paladone Products Ltd., UK. The set contains: 12 pencils, 10 small rubber bands, 4 large rubber bands, 4 table tennis balls, a 13 metre roll of sticky tape and full Guinness World Records instructions. This set contains: 30 drinking straws, 30 paperclips and full Guinness World Records instructions. Includes: 1 pack of playing cards and 2 Guinness World Records Instruction cards. 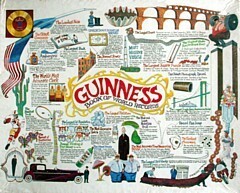 Includes: 21 paper cups and 2 Guinness World Records Instruction cards. Includes: 10 dice, 1 blindfold and 2 Guinness World Records Instruction cards. 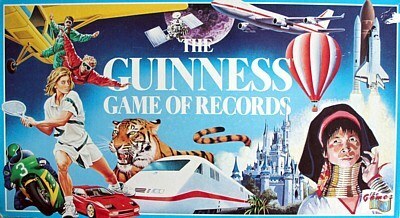 Includes: 28 dominoes and 2 Guinness World Records Instruction cards. The set contains: 40cm x 40xm Plastic Parachute, 4 Cardboard Squares, 2 Corrugated Squares, 1 Foam Square, 10 Straws, 2 Metres Plastic String and full Guinness World Records instructions. The set contains: 2 plane body units, 1 tail unit, 1 wing clasp, 2 propellers, 3 wings, 3 tails, elastic bands, full Guinness World Records instructions plus spare card to build your own wing or tail designs! Includes: A bag of midget gems, 50 cocktail sticks and 2 Guinness World Records instruction cards. 2011, 2013, 2015: That Company Called 'IF', UK. In late 2011, another Guinness World Records product was developed by That Company Called 'IF' of Pickering, North Yorkshire, UK. Similar card packs were produced in 2013 and 2015. A set of 52 laminated playing cards, each featuring a different World record. 2011: Paladone Products Ltd., UK. Following the launch of their Guinness World Records range in 2010, Paladone Products Ltd. of Shoreham-by-Sea, West Sussex, UK extended the range in 2011, and introduced new "Challenge" and "Pocket Money" range. Each of the five products in the Pocket Money range included 4 challenge cards (from a set of 20) to collect. Includes: A set of 15 modelling balloons, a pump, full instructions and a Guinness World Records instruction card. Includes: A bag of Milk Chocolate Beans, a pair of wooden chopsticks and a Guinness World Records instruction card. Includes: 40cm x 40cm plastic parachute, 4 card squares, 2 corrugated cardboard squares, 1 foam square, 10 straws, 2 metres of elastic string and a Guinness World Records instruction card. Includes: A bag of jellybeans, straws and a Guinness World Records instruction card. Includes: A stack of 50 sheets of origami paper, full instructions and a Guinness World Records instruction card. Includes: 16 paper planes with scored fold lines (4 high-speed flyers, 4 long-distance flyers, 4 duration flyers and 4 precision flyers), full instructions and 3 Guinness World Records instruction cards. Includes: A pack of 30 Guinness World Records Challenge cards, playing cards, a sand timer and full instructions. Includes: A set of 20 table tennis balls, 5 straws and 3 Guinness World Records instruction cards. Includes: A set of 200 Guinness World Records questions cards and full instructions. Guinness World Records Buzz Wire Game with built-in timer and an A4 Guinness World Records Poster. Guinness World Records Unicycle. Contains a unicycle with 16" wheel, A4 Guinness World Records Poster and full assembly instructions. Size 5 Guinness World Records Football; records for Timely Touches, Body Touches, Body Control, Marathon Ball Control, Team Tricks and Crazy Tricks. Guinness World Records Sunflower Growing Pot and 25 Giant Sunflower Seeds; records for Sunflowers and World's Tallest Plants. 1.4 metre Guinness World Records Parafoil Kite; records for Kite Stunts, Kite Records and Kite Travel. Guinness World Records Flying Disc, 4 Guinness World Records Challenge Cards. 50 Marbles, 4 Guinness World Records Challenge Cards. 1 Pack of Guinness World Records Playing Cards, 4 Guinness World Records Challenge Cards. 1 Guinness World Records Stopwatch accurate to 100th of a second, 4 Guinness World Records Challenge Cards. Guinness World Records Yo-Yo, 4 Guinness World Records Challenge Cards. 2010, 2012: Haywire Group, Inc. 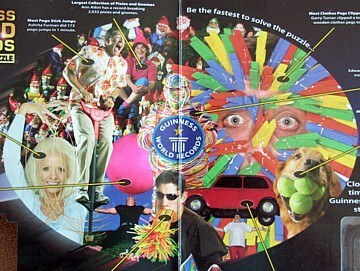 The Haywire group produced a number of Guinness World Records games and puzzles for their 2010 and 2012 catalogues. Contents: A 100-piece jigsaw puzzle (10" x 13") with a Magic Reveal Magnifier to learn about each world record. Copyright: Haywire Group, Inc., Karmin International and Guinness World Records Limited. 2012: Guinness World Records The Board Game! Contents: 250 Trivia Cards (500 questions), 125 Who Am I? Cards, 100 Tokens, 52 Card Playing Card Deck, 20 World Record Challenge Cards, 10 Chips, 10 Marbles, 6 Pawns, 5 House Record Challenge Cards, Guinness World Records Certificate, Dry Erase Brag Board, Dry Erase Marker, Rope, Domino Set, Die, Sand-Timer, Gameboard, and Easy-to-Follow Rules! 2012: Guinness World Records The Game! Contents: 50 Trivia Cards (100 Questions), 40 Who Am I? Cards, 40 Tokens, 10 World Record Challenge Cards, 10 Chips, Chip Challenge Card, Spinner, Sand-Timer, and EASY-TO-FOLLOW Rules! Contents: A 300-piece jigsaw puzzle (18" x 24") with a Magic Reveal Magnifier to learn about each world record. Records "Longest Ears On A Dog", "How's The Weather Up There? ", "Whale Of A Snail", "Teeny, Tiny Trotter", "Not Just Another Ponytail", "Super Spider", "Itsy-Bitsiest Kitten", "Wooly Giant! ", ""Long Hare! ", "Can-Do Attitude!" and "This Pig Can Fly!". Records "Pogo Power! ", "Super-Speedy Skateboarder", "Oldest Bungee Jumper", "Super Power On The Mound", "Mighty Biker! ", "Zippy Flippers", "Ice Hockey Mega-Match! ", "World's Oldest Ping Pong Player! ", "Look, Mom! No Skis! ", "Fuzzy Runner!" and "Bunches of Basketball Bounces". Records "Shortest Living Man", "One Big Bunny! ", "Record Collection", "Big, Big Burger", "This Dessert Serves Hundreds! ", "Fastest Furniture", "Quickest Milker", "A Really Big Twist! ", "Flip Out! ", "Wacky Wear" and "Grade 'A' Jumbo!". Volume 4: "Transportation and Travel"
Records "Going The Distance! ", "One Man. One Wheel. Hundreds Of Miles! ", "Tiny Takeoff", "Who Boasts The Most Coasters? ", "Longest Roller Coaster Ride", "Primo Limo! ", "World's Longest Motorcycle", "Mighty Mini! ", "Don't Rock This Boat! ", "Major Blader!" and "Running On Empty". 2010: Paladone Products Ltd., UK. In 2010, Guinness World Records and Paladone Products announced that a new range of toys and gifts would be produced for 2010 and 2011. The range (pictured right) consisted of 20 different products, most of which included an A5 Guinness World Records "mini book". Each of the mini books contains some challenges and a few pages of related World records. These gifts - and probably the mini books themselves - are bound to become collector's items in years to come. Launch base, air pump, hose and 2 rockets; records for rockets, accuracy, speed, long flights and frequent fliers. A Guinness World Records branded mug with 15 chocolate-related records. Chopsticks and 100g chocolate beans; records for chopsticks, rice, chocolate beans and chocolate. A Guinness World Records branded mug with 15 coffee and cake records. A skipping rope with built-in counter; records for skipping and fitness. Dartboard and darts; records for highest scores, least darts, marathon darts and professional darts. Diabolo; records for diabolo and throwing. Parachute and structure kit; records for eggs and parachutes. Height chart; no mini book, but 49 height-related records on the chart. A pack of white hopscotch chalk; records for hopscotch, chalk, playground games, sports day and party games. 5 straws and 100g jelly beans; records for straw, jelly beans and sweets & candy. 3 juggling balls; records for endurance juggling, bounce juggling, odd balls, joggling, extreme juggling and flashing. 50 glass marbles; records for marbles, playground games and sports day. A Guinness World Records branded mug with 15 office challenge records. 20 paper planes in 4 designs; records for paper planes, paper and real planes. Space hopper and pump; records for space hoppers and 100m records. Winding station, ramp, motorbike, flags and tape measure; records for ramp jumps, stunts and speed. A Guinness World Records branded mug with 15 tea and biscuit records. A Guinness World Records yo-yo; records for yo-yos. Notes A series of toys and booklets given with kids' meals at Chick-fil-A. Shown left are a "30-Second Records" pack and a "Hobbies and Pastimes" booklet. Below are the "Human Achievements", "Animal Tangrams" and "Sports and Games" packs. The 5 toys promoted the 2011 edition of Guinness World Records. 2006: Hasbro UK Ltd., UK. Hasbro UK Ltd., Caswell Way, Newport, NP19 4YH. This is a 250-piece jigsaw puzzle, together with a stop-watch, designed to allow you to "become a Guinness World Record Holder". Notes A series of toys given with kids' meals at Wendy's. Shown left are a "Personal Record Kit" and a "Basketball Set". A "Juggling Set" is pictured on the right, and a set of trading cards is shown below. Meadowside Books, Fleet Street, London. This pack contains a yo-yo and a small book ("everything you need to become a RECORD BREAKER and earn your place in GUINNESS WORLD RECORDS"). This pack contains a stopwatch and a small book ("everything you need to become a RECORD BREAKER and earn your place in GUINNESS WORLD RECORDS"). This pack contains some balloons and a small book ("everything you need to become a RECORD BREAKER and earn your place in GUINNESS WORLD RECORDS"). This pack contains a deck of cards and a small book ("everything you need to become a RECORD BREAKER and earn your place in GUINNESS WORLD RECORDS"). Notes A series of toys given away with Subway Kids' Pak meals in April and May 2003. Shown left is the "Wrist Timer" and below are the "World's Fastest Street Luge", "Elephant", "Supersonic Jet Plane" and "Tape Measure". Thanks to Billy "Rocketman" Copeland for donating some of these toys to us! 1999: Tiger Electronics, Ltd., USA. 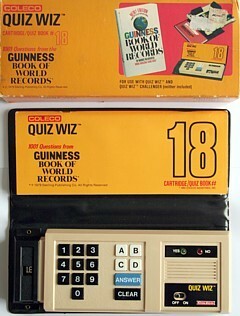 1999 Quiz Wiz. Guinness Book of World Records: "World Wonders"
1999 Guinness Publishing Limited and Tiger Electronics, Ltd.
Notes An electronic question and answer game (Model 65-157) with "2000 facts about nature and the world around you that will amaze and astound". The question categories are: "Big Deals"; "It's A Natural"; "Stupendous Stats"; All Over The World"; "Guinness Grab Bag". A "Fantastic Feats" version (Model 65-156) was also produced in 1999. Notes Six Christmas crackers made from pages of the 1993 edition of the Guinness Book of Records. Each contains 20 quiz questions, a scorecard, a mini pen and a hat. The box also contains an instruction sheet, list of answers and a 96 page booklet featuring The Guinness Book of Records selection for "Human World" and "Human Achievements" (right). 1992, 1988: The Games Team Ltd., UK. Produced by The Games Team Ltd, Huddersfield, HD1 1DL. The game contains 400 question cards in different categories ("Fib or Fact", "Connections", "Quick Wits", "Guess or Bluff", "Clever Clues" and "Picture Round"). Produced by The Games Team Limited, a subsidiary of Direct Mail Promotions Limited, Huddersfield, West Yorkshire, England. 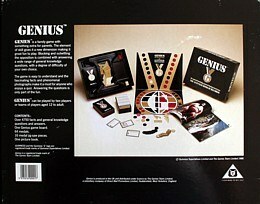 The game contains two packs of question cards (Facts I and Facts II, each containing 475 cards) and a 96-page book, "Genius Book of Phenomenal Pictures". Peter Pan Playthings Ltd., Guinness Publishing Limited and Diagram Visual Information Ltd.
Peter Pan Playthings Ltd., Bretton Way, Bretton, Peterborough PE3 8YA. Notes A series of three quiz games: Sport, General Knowledge and Rock & Pop (picture left). Each quiz contained 500 questions from the Guinness Book of Records or Rock Day by Day. 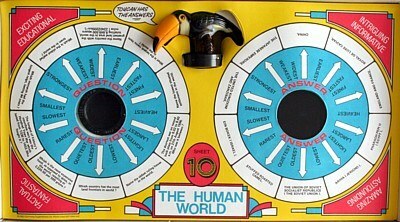 A variant of the popular Ask & Answer series of games where the token (in this case, the Guinness Toucan) points out the answer (right) to the question (left). The game had the following sections: "Sports, Games and Pastimes", "The Arts and Entertainment", "The Living World", "The Natural World", "The Universe and Space", "The Scientific World", "The Mechanical World", "The World's Structures", "Human Achievements" and "The Human World". Each section had 10 questions. The game "should prove both entertaining and informative to young people up to 116 years of age". 1980: Coleco Industries, Inc., USA. Notes A very basic 'electronic' game, with 1001 multiple choice questions taken from the "Guinness Book of World Records". The 1st question concerns Robert Wadlow; the last concerns the "largest boat sail". "The Human Being", "Human Achievements", "Animal and Plant Kingdoms", "The Natural World", "The Universe and Space", "The Scientific World", "Arts and Entertainment", "The World's Structures", "The Mechanical World", "The Business World", "The Human World" and "Sports, Games & Pastimes". The question booklet is 9 x 3½ inches, and has 118 numbered pages. Manufacturer Parker Brothers, Division of CPG Products Corp., Beverly, MA 01915. A game for 2 to 4 players, ages 8 to adult. Contains game board, plastic token, foam bounce-back device, 3 dice (two white, one red), 4 playing pieces, a record maker and a record keeper with 22 record cards. Copyright Sterling Pub. Co. Inc.
"Be the Best in the World. Set or Break the Guinness Record. Record Verification Form Enclosed." 1976: Great American Puzzle Factory, USA. Great American Puzzle Factory, Inc., New York, N.Y.
1975: Denis Fisher Toys, UK. Manufacturer Denis Fisher Toys, Thorp Arch Trading Estate, Wetherby, LS23 7BL, West Yorkshire. A game for 2 to 6 players with 294 Guinness questions and 10 games (events) in 5 categories ("Longest", "Strongest", "Mostest", "Greatest" and "Hottest").